“Who’s the leader of the club that’s made for you and me? M-I-C-K-E-Y M-O-U-S-E! Mickey Mouse!” Everyone loves Mickey! Disney is in no short supply of the mouse, that’s for sure. 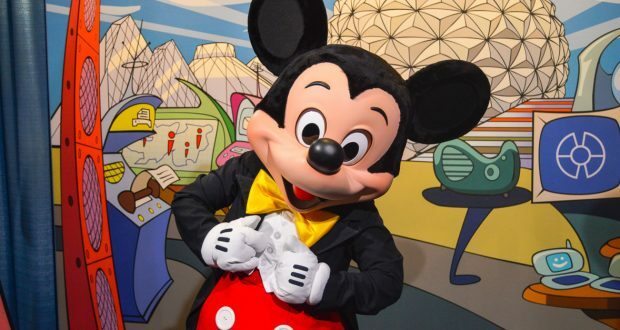 Here are ten ways to get your Mickey Mouse Fix at WDW! Mickey Bars are the ultimate Disney treat, in my not so humble opinion. You can find them pretty much anywhere Disney related: in the Parks, in all of the resorts, on the Cruise ships, etc. These bars are dark chocolate covered vanilla ice cream in the adorable shape of a Mickey head. They are always the perfect snack and bit of happiness. Mickey appears in most, if not all, of the Disney parades. All of the parades and stage shows depict some kind of story, whether it’s a celebration of a park or good triumphing over evil. And Mickey is always there! These are great ways to see Mickey without standing in the ridiculous like to actually meet him! 3. Mickey & Minnie’s Runaway Railway: We don’t know a whole lot about the new Mickey and Minnie ride coming to Hollywood Studios in 2019, but we do know it’s a win for Mickey fans! This will be an adventure ride based on the recent Mickey cartoons. You, Mickey, and Minnie will board a runaway trail driven by Goofy! I can only imagine the fun that will ensue! A great way to get a challenging Mickey fix is to look for Hidden Mickeys! Disney Imagineers carefully placed hundreds and hundreds of little (and sometimes massive – hint: Hollywood Studios) Mickeys all over the four parks. Sometimes this is a Mickey fix you didn’t expect! They seem to just pop up everywhere, and they’re so fun! At the heart of Fantasmic! is simply an excuse to show off how awesome Mickey is. 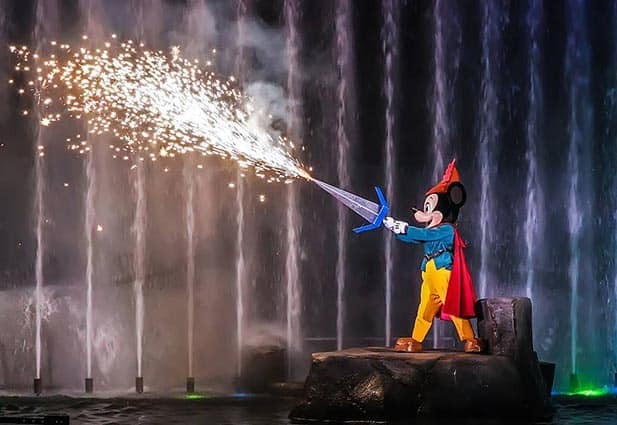 This awesome fireworks and water show in Hollywood Studios invites you to step into Mickey’s dream. But it’s being threatened to turn into a nightmare by Maleficent! Sorcerer Mickey and his classic buds need to save the dream. Fantasmic! is always a pleasure and a brilliant way to end your day! Based in the Contemporary Resort, Chef Mickey’s is a classic Disney restaurant. It’s an all-you-can-eat American buffet with added fun! Mickey and the gang make appearances throughout your meal for pictures, autographs, and I’ve heard even song and dance! This is a perfect Mickey fix. Mickey themed restaurant, while you get to hang out with Mickey himself? Yes, please! Magic Kingdom’s two holiday themed parties are Mickey’s Not-So-Scary Halloween Party and Mickey’s Very Merry Christmas Party. The holiday season is a busy time for Mickey! But so fun! At MNSSHP, you can dress up and go trick-or-treating with your favorite pals! And at MVMCP you can enjoy the season of cheer with your family. Extra time in the park means extra Mickey fix! Please welcome Maestro Mickey Mouse! In this 3D attraction Mickey is conducting a big concert, but Donald messes it up a bit by stealing Mickey’s hat! 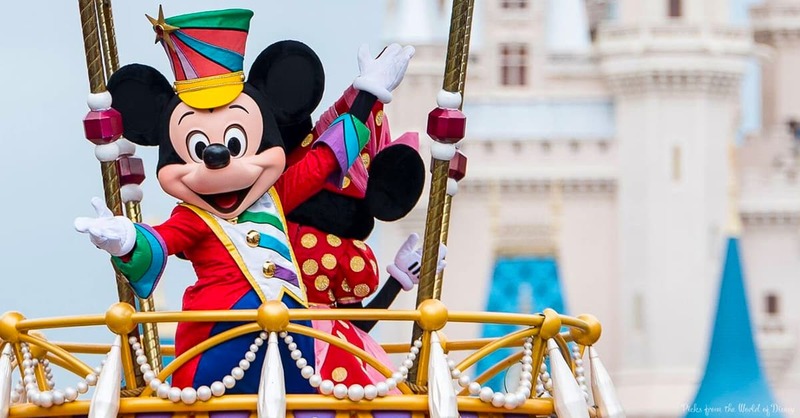 While you travel with Donald through various Disney scenes and songs, it’s still Mickey’s show! And, as per usual, Mickey comes through to save the concert in the end. This is a terrific meet and greet spot because it’s the perfect Mickey fix. 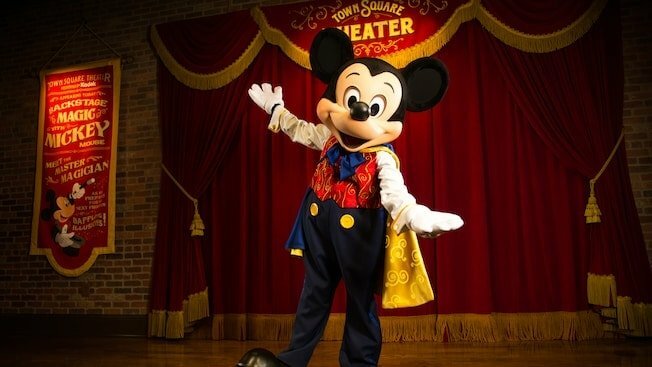 Guests go backstage to see what is basically Mickey’s dressing room, including posters and props and mementos from Mickey’s illustrious career. And you even get to hang with the Mouse himself! While this spot is fun, Mickey has a ton of meet and greet opportunities throughout the parks and they are all magical! Can’t forget the merch, right? There are so many Mickey souvenirs in the parks! Basically any shop you into will have something Mickey related. Mickey ears are a must. Every kid has to have a Mickey plush. And even as I type this, I’m sipping from my Mickey mug. This way you can get your Mickey fix from home too!